Join me in 30 Days of Gratitude! I have been thinking a lot lately about happiness, and gratitude, and living in the moment. I don’t know that anything I have thought about is unique, rather a constant state of learning and searching that we all experience. Day 1: Today I am thankful for a kind and helpful bank employee who is going out of her way to resolve a frustrating situation quickly. *Found on Pinterest. If you know the true source, let me know! I am grateful for the internet. It is sort of a big thing to be grateful for and I think you’re going for appreciating the small things in life, but I was trying to focus on something and I just kept coming back to being grateful for the ability to find special people like the bloggers I follow. 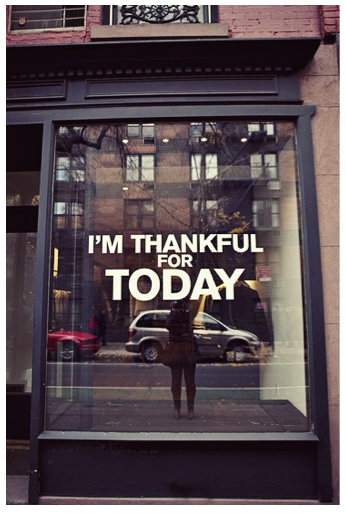 In a way, I am grateful for you and this post. Oh no, that is great! I am looking for gratitude of any size and any seriousness! One day I might be grateful for my mom and the next day for skittles! 🙂 And I know what you mean about the internet – it makes this small world even smaller. I’m glad you’re here! This is great! A friend actually did this very same thing over Facebook a couple months back. I really love the idea… It forces you to think of the good things happening in your life. Today? I’m grateful that I get to be apart of a start business that hopes to better the educational experience of local students. That sounds cool! What are you guys doing? Well, the company is owned by a married couple that started the business with completely personalized private tutoring that focuses on the tutoring that coincides with the student’s learning style while also creating a mentor to student type relationship. Now, we are all working together to open a center that will be a sort of base for the entire business. It’s also going to offer a great atmosphere for students of all ages to come study, and be tutored anytime throughout the day. We also plan to offer all sort of classes and workshops. Opening day has been decided for next Saturday… Can’t wait! Great idea – today I’m grateful for a good meal shared with friends. I always means to start a gratitude journal but never do – maybe this will provide me the jump start I need. I’m thankful that today is my Friday and I get to get out of town and see my sister this weekend!